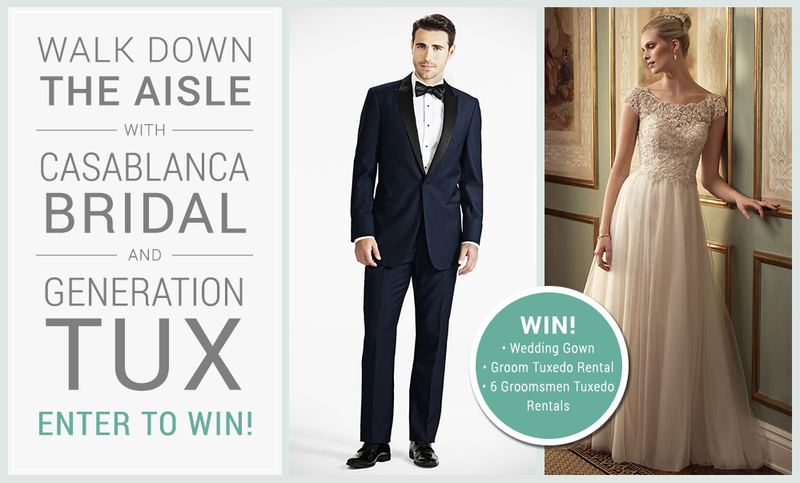 Win A Wedding Dress, Tuxedo, and Groomsmen Attire! Walk down the aisle with two of the industry’s most beloved bridal brands! Casablanca Bridal creates dresses that are handmade in their own state-of-the-art factory and is the only company with the ability to provide customization, ensuring that each dress is unique to every bride’s personal style and fit. Their mix of quality silks, tulle, lace, beading, Swarovski crystals and sequins allows Casablanca Bridal to create looks for every bride’s unique style. Generation Tux makes it easy for grooms and groomsmen to easily rent the highest quality tuxedos and suits online without ever visiting a store. Approximate retail value of prize: $3,000. By submitting, you agree to the Giveaway Terms & Conditions.